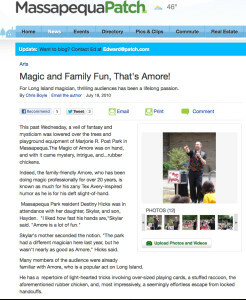 Public, private or corporate events, fundraisers, school events, library programs, grand openings, holiday parties, picnics, first birthdays, christenings, baby-namings, communions… no matter what type of gathering, if it is a family event with mixed ages of kids and adults, Amore is the performer you will want at your event! Catering to all ages, this show tops all others. Fast paced and original, this one of a kind performance will make audience members shine in the spotlight. Get ready for a show that you and your guests will be talking about for a long time to come. Amore’s show will amaze and astound no matter the size of your event. Colorful handkerchiefs turn to magic canes and objects materialize out of thin air. Spectacular visual magic combined with music captures the audience’s attention and brings them to a realm of wonderment. Audience participation is the main portion of the performance. Audience members become the magician’s assistant during the show. Amore utilizes costumes and other props for some hilarious comical routines. Balancing amazing magic and sidesplitting comedy, Amore has created a show with wondrous new original routines sprinkled with a few classics of magic that make for an unforgettable show. From the moment the show begins until the grand finale children and adults will be mesmerized and mystified. This performance takes up a small amount of space and you will find it is just right for most locations. Not too big, not too small and perfect for any location (indoors or out). Whatever the venue Amore can accommodate by adjusting his show to fit most any venue. Wacky balloon sculpturing: Crazy and colorful hats, dogs, flowers and rabbits are just a few of the wide selection of great balloon sculptures your guests will choose from. 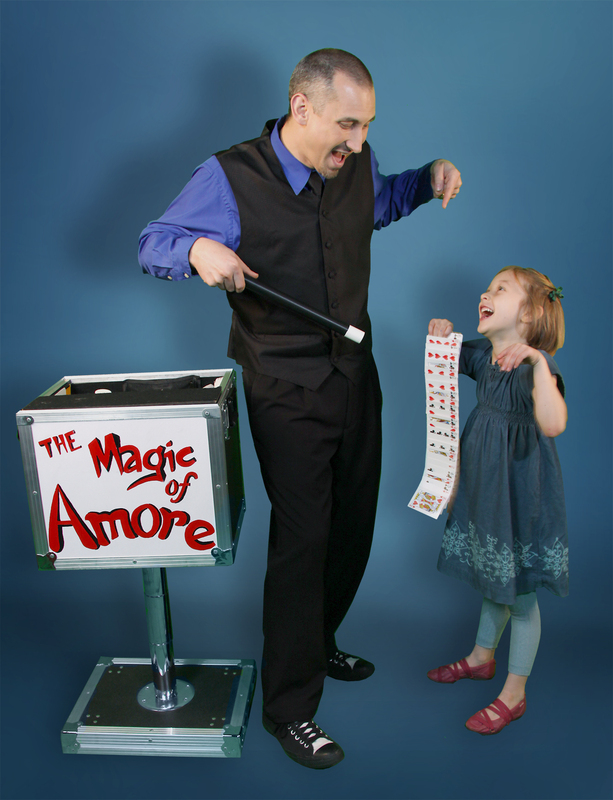 Amore’s unique magic workshop: Great magic performances always leave audiences clamoring for information on how they can do magic. Join us for a workshop that introduces children to the fascinating world of magic and illusion. Who better to learn from then a professional magician?! Guests become magicians in training. Each child will experience hands-on fun and the opportunity to challenge themselves and amaze others by taking the magician’s oath and learning a quality trick that they will receive to take home. Amazing illusions: Audience volunteers will experience weightlessness and float in mid-air during the classic of magic titled “The Levitation”, the original melting a person through a mirror or maybe you would like to perform the famous “Sword Thru Neck” illusion (age specific) and attempt to escape from Houdini’s shackles? Close-up sleight of hand: Close-up interactive walk-around entertainment includes a well-balanced mixture of enchanting magic and amazing feats of mind reading. Amore utilizes common and familiar items to create the most personal and original form of conjuring. All routines are age appropriate, filled with audience participation, humor and fun. As an added gift each child guest will receive a special “Magic Ticket” which allows exclusive access to online magic teaching video lessons for free. Featuring hand selected lessons from the popular video ” The Mysteries of Magic” Starring Amore the magician. All shows are self-contained. Amore brings all the necessary items to perform the entertainment properly, i.e. table, sound system, props.